The Tectona grandis - Teak Tree - is a deciduous, medium to large sized tree, growing to 100 - 130 feet in height. The trunk is generally straight and the lower 60 feet is branchless. The diameter of the tree grows to 60 - 70 inches. The growing practices of teak are very similar to those of citrus in respect that both crops require the same care during the first three years with less and less care during the later years. It appears that teak can be grown in most areas of <?xml:namespace prefix = st1 />Belize, surely as a substitute for citrus. The recommended planting time in Belize is during the rainy season, but planting teak stumps instead of teak plants can also be done during the drier periods. There are some areas in Belize where teak is being grown right now, but the limited success depends more on the management of the plantation than the prevailing climate. Teak does not have the harvesting deadlines that citrus does nor the problems involved with marketing and processing. After 5 - 7 years the first harvest can be expected because a large percentage of the trees will have to be lobbed (removed) for thinning. These are generally sold for posts. The following cultural growing information will be helpful in establishing a successful teak plantation. Teak is a strong light demander and a long-lived pioneer, it is said to be sensitive to competition at the level of the crown and of the roots, but can be associated with species having a deep root system. In deep soils teak develops a taproot which makes it resistant to winds. In more shallow soils teak will develop several very strong superficial roots which are concentrated in the upper 50 cm of the soil and may extend up to 20 m from the stem, ensuring its stability. Its fibrous bark makes it resistant to fires which are favoured by the thick layer of easily inflammable litter. The sprouting of buds during the first rains precedes a period of fast apical growth (one month). Flowering takes place after the period of growth in height, followed two months later by the maximum increase in diameter of the trunk. In plantations, the first flowering occurs after the second or third year. As the inflorescences are terminal, they frequently cause forking of the trunk which sometimes disappears when the tree grows. The height under the fork, representing the height of the exploitable trunk, depends in general on the earliness of first flowering. In good conditions and with good provenances, the initial growth is very fast and self-pruning. Nevertheless, as teak is sensitive to competition, its growth can slow down quite rapidly in un-thinned populations and therefore the first thinnings have to be done early. With good silviculture, in the best class of fertility, a well-managed plantation can produce a volume of about 400 m³ per ha of wood in 25 years. In poor soils or in bad rainfall conditions, growth is slow, the trunk is short and the branches are thick, therefore the production can be less than 85 m³ per ha in 25 years. In extremely poor growing conditions, teak can survive many years in the form of bush wood. Statistics show that under very good conditions in Nigeria, an exceptional production of 24 m³ per ha per year has been reported. In Côte d’Ivoire yields of 10 - 16 m³ per ha per year are recorded in the forest zone, 7 - 10 m³ per ha per year in the transition zone and 5 - m³ per ha per year in the savannah zone. In Tanzania the best plantations are said to produce up to 14 - 17 m³ per ha per year. 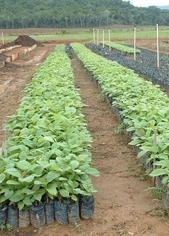 Planting material can consist of seedlings or stumps. Seedlings have been transplanted in waiting beds or in one quart plastic bags. Stumps are seedlings which have been transplanted into waiting beds until they reach about 15 - 20 mm in diameter, then they are prepared for planting by pruning off both the shoot and root. Generally 25 - 50 mm of shoot is retained and about 15 - 20 cm of the root is left intact. This remaining material is known as a stump and is the easiest to transport. 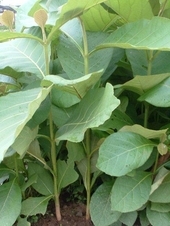 It has been reported that teak planted as stumps have a success rate exceeding 90% even without rain for the first 10 - 15 days after planting. Stumps can be stored several weeks before planting by heeling them in a shady place or in moistened jute sacks. In Asia special methods allow the stumps to be stored for several months before planting which makes it possible to prepare them before the dry season and to plant them as soon as the first rains begin. The planting of stumps encourages fork formation. Therefore removal of all shoots except one should be done as soon as possible after planting. Teak can grow in many kinds of soils but the quality of growth depends on the depth, structure, porosity, drainage and moisture holding capacity of the soil. Teak thrives best in soils that are neutral or slightly alkaline, so the most favourable soils for growth and development usually have a pH of between 6.5 - 7.5. Waterlogged, shallow and compacted soils should be avoided. Teak is a 'calcicolous’ species and requires a relatively large amount of calcium in the soil for growth and development (White 1991). Teak plantations can be found from sea-level up to 1,200 m altitude. Young plants do not tolerate competition of large weeds nor being shaded for too long by a canopy, even if the canopy is not dense. Fertilizers applied at planting time will enable the trees to dominate the weedy vegetation rapidly. During the first year three weedings are recommended, with two weedings during the second year and one weeding during the third year. Damage to the roots during weeding should be avoided because teak is very sensitive to root rot. Negative effects to damaged roots only become visible many years later. Abundant fine absorbent roots form on young teak plants in the uppermost soil layer during the wet season, but largely die off in the dry season and are replaced by new roots that develop in the deeper layers, provided soil aeration is adequate. In deep loam soils a taproot develops early and becomes the main water supplier. In older trees, the taproot, though long, is not very thick. The water supply in the soil has an intimate effect on the area of fine water absorbing rootlets and their distribution throughout the soil. In waterlogged alluvial soils and in clay, roots are stunted and the taproot is very poorly developed. The planting lines should be deep-ripped to a depth of at least 20 inches and if needed, agricultural lime should be incorporated into the lines so as to raise the pH of the soil to a suitable level. During the first three years it is recommended that weed growth be controlled and mowing be done between the trees followed by spraying around the trees. Tree spacing depends on a number of factors, but we recommend that at least a nine foot spacing all around be maintained. This will allow for tractor mowing and easy access to the fields. A complete fertilizer with trace elements should be applied at the time of planting. This can be applied in two split applications: one at the time of planting, the other before the end of the rainy season. Pruning - From the very beginning you need to remove all side shoots, which is easy to do when they are just starting to grow. If side shoots are left to grow they will diminish the energy for growth of the main trunk. A large or deep cut in the bark can be an invitation to diseases. If large branches need to be removed, a ½ inch stub should be left. Side branches should be removed up to a height of at least 20 feet or whatever may be practical. Thinning - Teak requires a lot of light and will suffer when suppressed. The crown of the tree requires freedom on all sides for proper development. It grows best when the plants and trees are of a similar size and are regularly and heavily thinned. Growth should be monitored regularly and thinning should start before the stand is suppressed. In a properly thinned plantation, the crop should look distinctly open and individual crowns should have clear space all round. Trees with the best crown development and stem-form should be retained and should be evenly spaced, even if this means the sacrifice of some other trees with good crowns and straight trunks. All trees with poorly developed crowns and stems should be removed provided this will not result in permanent canopy gaps. Teak is not very susceptible to the different pests and diseases. Generally, defoliators and skeletonisers cause the greatest problem. However, chemical control except in nurseries or young plantations is not practical. The life cycles of these pests are so short and follow each other so rapidly that it is not considered cost-effective. The main strategy should be on limiting the food supply by weed control during the first three years. The heartwood is brown-yellow, darkening and developing to a golden shine with age. It is sometimes beige and may show darker veins and occasionally is completely brown-black due to regular exposure to bush fires, the latter condition generally not being appreciated by the wood-processing industry. It is distinctly demarcated from the whitish sapwood, which is 2 inches wide. The grain is usually straight with rather coarse texture. Growth rings are distinct. The wood is oily to the touch and has a characteristic smell of old leather when fresh. Teak dries very well but rather slowly. Boards of 1/2 inch thick will take 15 days to air dry from a moisture content of 40% to 15%. Boards of 1 inch thick will take about 30 days. Boards of 1 inch thick can be kiln dried from a moisture content of 40% to 10% in 5 - 6 days at a drying temperature of 140 - 210 F. Teak is not difficult to work, but requires some effort, mainly because of the presence of silica (up to 1.5%). Stellite-tipped saws and tools tipped with tungsten carbide are indispensable for sawing and planing teak. The wood is difficult to chisel, but will turn out well. Owing to its beautiful figure, teak is in great demand as face veneer. The wood can be peeled, but slicing gives the most beautiful and varied veneer patterns. Teak heartwood is rated as durable to very durable. Stake tests showed an average service life in contact with the ground of more than 10 years under tropical conditions and more than 25 years under temperate conditions. However, there are indications that the durability is significantly influenced by the age of the tree. Teak is very durable under cover. The heartwood is resistant to termite and fungal attack, and resistant but not immune to marine borer attack. The resistance of teak wood to termites and fungi is due to the presence of certain chemical in the wood. Teak is one of the best timbers and existing plantations are unable to meet the demand. Its numerous applications, its easy propagation and its resistance to bush fires make this tree more and more appreciated by rural communities. Teak has been a highly appreciated timber for centuries in its region of origin. Wooden sculptures, doors and coffins made of teak have been found in good condition after more than 1,000 years in Indian and Persian temples. Under cover, teak is considered virtually imperishable. It is the preferred wood for naval construction, elements of boat hulls and bridges of boats because of its extreme resistance to decay and corrosive activity of water. It is suitable for a variety of uses: luxury cabinet-work, frames (doors and windows), furniture, parquet flooring, staircases, carpentry, garden furniture, railway sleepers, bridges and other construction in contact with water or the ground, electricity and telephone poles, fence posts, railcars, barrels and vats for liquids, even corrosive ones, various utensils (except tool handles because the wood is brittle), turnery and sculpturing. Although its silviculture has been mastered, the technology is not sufficiently popularized to be able to optimize the quantity and quality of its production. Some say that the growth rate has little influence on the physical properties of teak wood; others state that a diameter increment of 1.2 cm per year gives optimal wood quality, while an increment of less than 0.5 cm per year leads to inferior wood. Presently there is a tendency to reduce the turn-over period to less than 25 years, while traditionally teak has been harvested at 35 - 80 years. Although teak is tolerant of fire, fires of the ground cover must be avoided to preserve the long-term productivity of teak plantations, because they leave the soil bare and cause erosion. Several thinnings are carried out in a tree population and the final harvest is by clear cutting. Independently of the growth rate, the turn-over period determines the proportion of heartwood which is about 35 - 55% at the age of 13 years; 65 - 90% at the age of 20 years and almost 100% at the age of 25 years. Although statistics are rather incomplete, it is estimated that the current teak plantations cover 5.7 million ha worldwide. In tropical Africa the teak plantations cover about 250,000 ha. The most important teak-producing countries in Africa are Nigeria (70,000 ha), Côte d’Ivoire (60,000 ha), Benin (21,000 ha), Ghana (17,000 ha), Togo (16,000 ha), Sudan (14,000 ha), Tanzania (10,000 ha) and Senegal (2,500 ha). Currently the world production of teak (about 2 million m³ per year) covers about 1% of the world demand for timber and teak is the timber that is highest in demand. In Africa the largest exporter is Côte d’Ivoire with over 100,000 m³ of logs per year (127,000 m³ in 1998), followed by Ghana, Nigeria, Togo (1700 m³ during the first 4 months of 2004) and Cameroon (40 m³ of sawn wood in 2003). A small part of the African production is exported to Europe, but the major part is exported to India which has equipment available to process small logs and has ample manpower available to do the processing. India is the largest importer of raw teak and also the largest exporter of processed teak wood.